Have a wonderful weekend and get ready because Christmas August is almost here. It's time once again to usher in Thursday, the day of the week where we are encouraged to share three things no matter what they are or how random they seem. 1. Happy Happy Birthday to Middle Sister who turns a year older today. Click here for last year's birthday tribute. 1b. Please click here for a picture of the Chesapeake Bay Sisters (minus Baby Sis who was not yet born) from circa 1970. 1c. For a most entertaining story written by Chesapeake Bay Mother about Middle Sister, click here. 2. I am really looking forward to the weekend. 3. These heron shots were taken a couple of weeks ago on an impromptu boat trip with some neighbor friends of mine. These were taken last week from Ridgefield Road, where I hardly ever occasionally like to go jogging. It's a very peaceful road. Just to clarify, I wasn't jogging with my camera. These were taken afterwards, from the safety and comfort of my car. This ordinary looking field actually held a little surprise the particular morning I was there. Although you can't tell in the photo above, the shot below shows several young turkeys. I startled a whole herd flock? bevy? covey? family of turkeys that included about 8 or 10 babies. They had no interest in having their pictures taken, but I managed to capture at least three, possibly four of them below. The quaint house below lives just beyond the field where the turkeys were. You know that chain draped across the driveway was just begging me to hurdle it. I used to be a halfway decent hurdler back in the day. Sometimes when I go plodding along barely faster than a walk jogging I often flash back to those days and wish I could run one more race. They were only fifteen or sixteen seconds in length, these hurdle sprints, but man were they intense and action packed. Since hurdling again is probably out of the question, however, I have decided I really want to join a roller derby team. If anyone out there has connections, I can guarantee you I'd be a great addition to any team. I have enough speed and attitude aggression to make up for three people. In fact, Big Hair Envy and I are talking about attending a roller derby match? meet? event later in August. I personally can't wait. Anyway, I felt like hurdling the chain but didn't, for obvious reasons not the least of which was why not just step over the dang chain-- there's no need to hurdle it--but no matter what there's the whole trespassing thing. So, for the time being I opted to keep on going. p.s. Is there a specific/more appropriate word for a flock of turkeys that includes babies? Deltaville Jamie, are you reading? You always know these things. Thanks in advance, expiring minds inquiring minds want to know. The other day on the way down to Bavon, I stopped at one of my favorite intersections in the county, where Route 600 meets 14 in an area known as Shadow, near the New Point firehouse and the site of the old New Point school. This charming building and the one across the road always seem to beckon whenever I'm down that way, almost like they're flagging me down, begging for some attention. I'm very happy to give some. Photos of this structure will be included in the book I'm never going to finish working on; it was once a store that also housed the Shadow post office. I wish I had taken these pictures sooner, because the lighting is better here than in the one I submitted to the editor already. But whatever. Speaking of the book, I was notified yesterday that it should be ready for sale by December 5th. I still have some blank pages to fill and lots of editing to do, but it's nice to know there's a light at the end of the tunnel. Let's get back to this building, patiently awaiting our return from this unnecessary tangent. You can't tell from this picture, but an old boat is hiding to the left just behind the bushes there. I could--and believe I will-- go off on yet another tangent, this one relating to this sign which was placed here late in this building's life. If you had to make a list of the top few things (not people, things) you really, truly need (as opposed to simply want or desire or think you require), what would that list include (besides obvious answers such as shelter and transportation)? I'm not sure I have an answer just yet. I'll have to think about it while daydreaming at the paying job today. Thank you for enduring a blog post which started off talking about a quaint building in the Shadow area before quickly careening into the topic of my extreme introversion the book, and then fishtailing into the topic of so-called needed things. Last Thursday morning after taking a jog and prior to running a million errands, I drove down to Bavon and piddled around at the New Point Light observation deck. Never underestimate the importance of piddling around. It's right up there with lollygagging and dawdling. If anyone needs lessons in how to piddle around, lollygag or dawdle, please let me know, I'm the global local expert. Ann Marie is related to Elzy Burroughs, the man who built our lighthouse. Her father Henry and she came over Friday night for dinner. Among topics of conversation ranging from jogging to the heat to tomatoes to the Bible to kindred spirits, the lighthouse came up. In addition to building our lighthouse, Elzy also built Old Point Comfort lighthouse, further south. Lest you be wondering why anyone would use the word "lest" why there's all this talk about the lighthouse and not one single photo of it, the answer has to do with my camera and the zoom on it and my lack of patience with the whole thing. In short, with only a few exceptions, any time I've tried to capture the lighthouse from this deck (which requires some zooming in) the photos come out blurry. And that makes me mad. And when CBW gets mad, her head spins around completely on her shoulders nothing productive can possibly come about unless you count stomping, and I don't, so please enjoy these photos of the observation deck while you imagine a nice lighthouse off in the distance. Or better yet, click here for yet another of my midsadventures one of the few photos I've taken that's not blurry. Click here or here or even here for more information about the lighthouse. Thursday morning I drove down to the end of the Earth county to check on the beautiful marshes and the lighthouse. I was relieved to see that everything was just as I remembered it. The greens and blues were so overpowering, I actually gasped. Then, when a horse fly flew in the window I'd rolled down to take a few pictures, I screamed. p.s. I only screamed when he landed on me. If you've ever been bitten by a horsefly, you don't need any explanation for that scream. This concludes the third consecutive blog post involving insects or my screams. Both are quite common here in Mathews. 1. It's hotter than blue blazes here now, and more humid than the Amazon Jungle. Yet no matter how hot it gets I still love this time of year. I love the sun, the bright light, and the extreme heat warmth. I love sweating, even. In fact, I'll take a hot, sweltering July summer day over a cold, dark January night any day of the year. 3. To preserve peace in a staff meeting at work yesterday, I was forced to kill a jug hornet, which I didn't want to do. Although I don't really care for insects, I have no particular desire to kill them unless absolutely necessary. When one of my co-workers started freaking out over the fact that one was in our conference room, my boss (a man) glanced over at me and said, "Chesapeake Bay Woman is a country girl; she'll take care of it." I assured them the jug hornet (or whatever it was) had no interest in harming us, however nobody believed me. So things escalated, and I had to kill it. When I told my mother this story last night she said that karma would ensure that I would come back as a jug hornet in my next life. So, there's that to look forward to. 'Tis the season where almost every evening there's a good chance of a thunderstorm. That season runs from July through about September. We have lots of seasons around here: Old Bay seasoning deer season; turkey season; daffodil season; crab pot season; grass cuttin' season, hurricane season, and invasive insect season, to name just a few. They're a little out of order just like everything else around here. The first few were taken after the storm passed. The one below was before the storm hit. This particular evening, the Chesapeake Bay Children and their friends were outdoors playing volleyball. Not long after I called them all inside, a bolt of lightning struck very close by. I'm reasonably sure the vast majority of the citizens of Richmond could hear the scream I let loose. In fact, the lightning struck so close I ran to the window to make sure my parents' house next door hadn't been hit. Of course it hadn't. And the storm quickly moved on. And the Chesapeake Bay Children and their group of friends got a good laugh at this frazzled mother's expense. Here in Mathews, there's really no such thing as traffic. Our roads tend to be tranquil. And for the most part our drivers are in no real hurry to get anywhere. Unless you count the Kamikaze commuters on Route 14 headed out the county towards Gloucester at 6:30 a.m. every weekday. Sure, there are busy times in the Court House, especially on Friday and Saturday mornings in the summer when locals and tourists box each other out at the deli counter of the Best Value or Food Lion gather at the local grocery stores to purchase their weekend necessities. But for the most part, our roads are sleepy and lazy. Pretty much the only time I can recall any noteworthy traffic events was when they were putting in the sewer lines last winter, or here recently when they reconfigured Ward's Corner. Even then, I took great joy in waving to the guys holding the Stop or Slow signs. Having to stop wasn't an inconvenience or a frustration at all. It was almost nice having something different tossed in to the otherwise routine and uneventful trips to the Court House. I lived in Northern Virginia for 13 years, where the whole notion of traffic was originally invented. Whoever invented that traffic set down some very rigid rules, such as "The minimum time it will take to get anywhere is At Least Ten Times Longer Than Necessary x Two, Squared, Then Cubed, Or Until You Burst Into Tears, Whichever is More Painful And Takes Longer." I know this guy on the tractor. I'm very content living in a place where the most frustrating traffic inconvenience is a slow-moving tractor traveling to the right of a solid Do Not Pass No Matter How Much You Really Want To yellow line. Route 198 near the Ruritan Club and CBW's house and Smither's Cemetery. The guy on the tractor lives just up the way. Last but not least as it relates to traffic around here--I love living in a place where honking your horn is assumed to be a greeting rather than a sign of road rage. These shots (along with Friday's) were taken from the public landing at the end of Town Point Landing road just below the Court House. That public landing used to be a prime place from which to view submarine races back in the day. Not that I personally know anything about any of that; it was just common knowledge. Those little creatures clinging to the reeds of grass are periwinkle snails, which are very common around here. Of course, we never called them periwinkles when we were kids. They were just snails. And they were a source of amusement, believe it or not. I remember sitting down along the shoreline staring intently at them for hours on end, there was nothing else to do around here an inordinate amount of time. What kind of a kid finds amusement staring at snails? Probably the same sort of person who finds great joy in wearing a crab hat, would be my guess. One thing's for sure, this person is a tad off kilter, if not bizarre very easily entertained. According to my BFF Wikipedia, periwinkles were introduced to the Atlantic coast of North America possibly by rock ballast in the mid-19th century. Another site stated that they are among the few sea creatures which breathe air, and their name comes from the Old English "penny winkle," since you could buy them for a penny per handful or two pennies per pound. According to this site, they are believed to climb the marsh grass to avoid predators such as the blue crab. I wonder if I could get any sort of reaction out of them by wearing my crab hat down by the shoreline? Guess who's just silly enough to try? Last but not least, whenever I see the word "periwinkle" I think of the Crayola crayons shade of blue. Aside from staring at snails, coloring was a big activity in the Chesapeake Bay Family household. One of my favorite shades was cornflower blue. This concludes our brief look at how little there was to do around here as a kid periwinkles. After a most impressive thunderstorm Wednesday night, we awoke to a crisp, clear, almost fall-like day on Thursday. Every blade of grass, every leaf, everything seemed to burst with color. Also, every blade of grass in my yard that I had just cut Monday evening was now past my ankles. In addition to the gift of exuberant colors and cool weather, Mother Nature gave us the most enchanting full moon last night. If I knew how to use my camera properly I'd post pictures of that gorgeous moon here. Alas, I'm only comfortable using Auto Mode in most areas of my life. As I write this, a cool breeze floats through the screen door; crickets are expressing their appreciation for whatever it is they're happy about; an osprey makes his last calls of the night, and I'm reminded for the millionth time why I love living here. Have a great weekend full of color, light, cool breezes, and relaxation. Welcome to the day of the week known as Three Thing Thursday, where we share tres cosas, three things. Of course, tres/three is only a suggestion. I've never been a fan of arbitrary rules, and three is a rather arbitrary number. So if you feel like sharing one thing, please do so. If you feel like sharing ten things, have at it. Let's stop worrying about numbers and begin. 1. 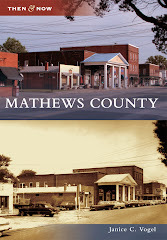 These pictures were taken back when I used to actually take photographs of Mathews County and not my crazy family or scenes from the front seat of a moving automobile the back yard. But as I've mentioned ad nauseam, I haven't had any time to go on one of my infamous local adventures, so old pictures will have to suffice for the time being. 2. I saw four white ducks swimming in a ditch beside Route 198/Buckley Hall Road coming home from work today. For those unfamiliar with Mathews County, we don't typically see ducks swimming in roadside ditches around here. Herons hunting frogs or whatever they hunt are a familiar scene in our ditches. But ducks? Not ever usually. 3a. I appreciate everyone who gave me suggestions in yesterday's post regarding my computer quandary. Please keep them coming, because it will be a while before I can make the trek to Best Buy or wherever to get anything. But I do sincerely thank you for your input. 3b. If you have a chance, click here for my mother's blog post about the climb to the top of the Hatteras lighthouse last week. Also click here for my neighbor's account of our recent boat ride up and down Queens Creek. Now it's your turn to share three things. Or four things. Five things. Or more things. Since I've been otherwise preoccupied for the past year several months; and since last week was spent out of town; and since all I've done this entire week is drive and work and drive and work work, there's been no spare time to focus on what I really like to do, which is dillydallying photographing the county of Mathews. Out of desperation, however, I snapped a few photos on the drive home from vacation last Sunday. For the time being, we won't discuss the utter and complete lack of quality of these photos. I'd also like to state for the record that taking photos from a moving vehicle is ridiculous, among many other things less than ideal. No, for the moment I'd like you to focus on the beautiful sea of green in the soybean field in the top photo. And the ocean of green corn in the bottom photo which would have been more visible had I zoomed in, but that's hard to accomplish when you have all of two seconds to whip out a camera and focus properly while stopped at an intersection with cars patiently waiting behind you. 1. The individual is way behind the times, ridiculously averse to change, but once she gets used to something will stick with it forever. As in until it becomes obsolete. 2. The individual's only first jaunt into technology was 1987, and it was a manual typewriter Wang word processor. 3. The individual has never purchased her own computer. Ever. She has relied on the kindness of friends and hand-me-downs. She panics when she enters a Best Buy and would rather die than talk to a sales person about her technical ineptitude needs. 4. The individual takes lots and lots of pictures and does not back anything up--except to the C: drive. 6. Refer back to #1 above. Repeat, three times. Laptop, PC, netbook, netflix, or what, and what brand, what sort, how much memory, how many gigawhatevers, and what else? Thank you in advance for your suggestions, which no doubt will require my teenager's interpretive skills; a flood of follow up questions; and many months for me to actually act upon. As I mentioned yesterday, hats were a large part of the family fun last week. But standing around laughing and giggling while wearing silly hats wasn't the only thing we did, believe it or not. Middle Sister read a book. All of us thoroughly enjoyed the beach. From body surfing to skimboarding to doing unintentional back flips in the surf just wading in the surf, the water was spectacular. There's something very healing and invigorating about the ocean water. Thankfully, CBW did not try skim boarding this year. She learned her lesson a couple of summers ago. CB Daughter is the skim boarder extraordinaire. My sisters and parents drove down to Buxton to cause a ruckus at the top of the lighthouse visit the lighthouse one day. I won't say exactly what happened there, but if they are reading and care to share the story, I encourage them to do so. I found it to be highly amusing. Perhaps Chesapeake Bay Mother can write the story on her blog. They had such a good time there (with, perhaps, a few exceptions) that they convinced the CB Children and I to head down there later in the week. Except just after we purchased the tickets, a rumble of thunder shut the whole place down. So we never made it up to the top, sadly. The look on CB Son's face below clearly indicates his lack of enthusiasm at the entire outing. It was blazing hot, he was tired and starved to death. What he's really saying here is, "Can't we just eat something and go take a nap on the beach?" CB Daughter, on the other hand, was thrilled to be doing something different because she needs to be doing something all the time. Lying around sweating in the sand is not her cup of tea. It's a balancing act, trying to make everybody happy. Our family is completely unbalanced rarely in balance, by the way. But we do our best. Below are some random shots. Baby Sister's Friend Dino - He's simply hilarious. There were always clouds passing around us, but luckily we avoided most of the rain. This is how I looked when I walked into work Monday morning. In addition to being a fair representation of how I feel about being back home and back at work, the above image reflects the collective mood of Chesapeake Bay Son and I when Daughter declared her ardent desire to go putt putt golfing on the ride home. So, after packing all our stuff (including stuff we didn't have on the trip down) and hauling it down several flights of steps and then trying to jam it into the car, we finally headed north. After about 45 minutes of driving, we stopped at Jurassic Putt in Nags Head and underwent the torture that is miniature golf in heat when you really need to be getting down the road to beat traffic played a spirited round of miniature golf. Chesapeake Bay Son came in first. Daughter came in second. I came in last. And although there are a few choice words I could use to describe the whole thing, I believe the photo above says just about everything I could possibly write here.